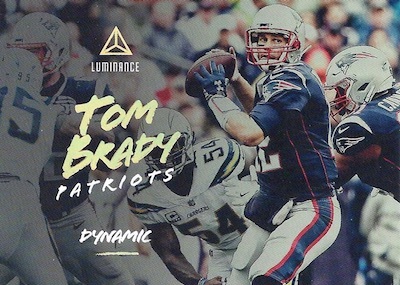 2018 Panini Luminance Football puts the spotlight on top NFL stars and rookies with a very distinct style. The debut release for the brand averages three autographs and one memorabilia card per Hobby box. 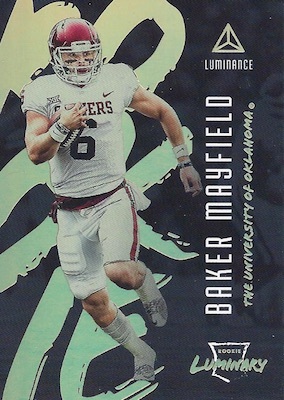 Skewing more to the modern, the base 2018 Panini Luminance Football design features a full-bleed, action image, complete with large player text across the middle. Rookie cards note the team that drafted them. There are also parallels that tweak the matte look, including Gold, Blue (#/99), Platinum Blue (#/25), Red (#/10), Pink (#/5), and Gun Metal (1/1). 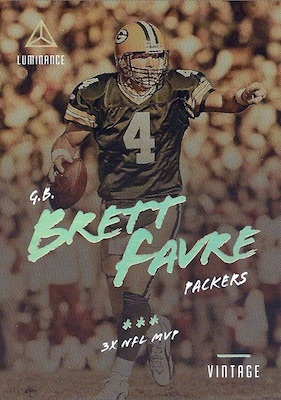 The Orange parallels, numbered to 225, are actually in 2018 Panini Prestige Football. 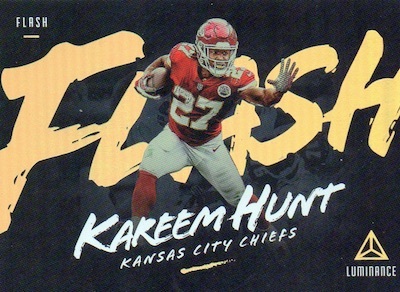 Inserts let the darkened background and massive text do the talking with Flash for the most electric players, and Luminary for the top rookies. Inserts combine to fall one per pack and four per box. 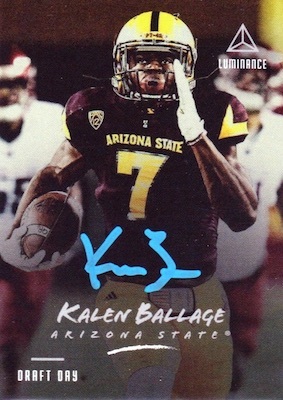 While the 2018 Panini Luminance Football checklist boasts multiple autograph sets, collectors will likely be drawn to Draft Day Signatures. 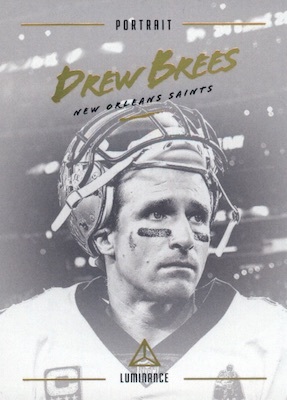 Hard-signed and falling in every other box, these rookie autographs also come in Gold, Silver and White ink editions. Draft Day is likely to enjoy considerable attention, at least early on, as it provides the first on-card rookie autographs for 2018. 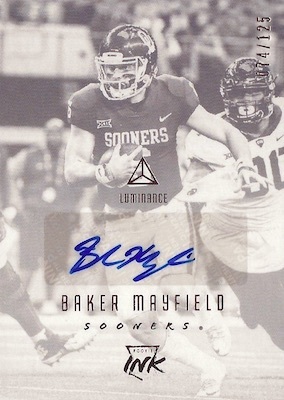 Rookie Ink is another set geared to the first-year standouts, with Gold (#/99), Blue (#/75), Platinum Blue (#/25), Red (#/10), Pink (#/5), and Gun Metal (1/1) parallels. 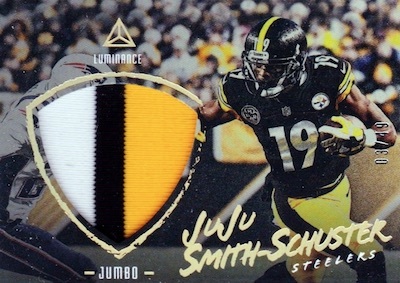 Meanwhile, the similar Ink tackles the legends of past and present, adding Gold (#/49 or less), Platinum Blue (#/25 or less), and Gun Metal (1/1) parallels. Other veteran-driven autograph inserts come via Spotlight Signatures and Autograph Jerseys. These, too, have Gold (#/49 or less), Platinum Blue (#/25 or less), and Gun Metal (1/1) versions. 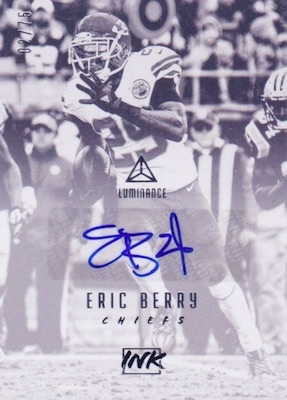 Filling the final hit per box, the memorabilia selection in 2018 Panini Luminance Football delivers a few choices. This includes Jumbo and Vintage Materials, each with limited parallels. 2018 Luminance SAM DARNOLD SILVER INK Auto Draft Day USC Rookie Ink Rc HOT! PARALLEL CARDS: Gold, Orange #/225, Blue #/99, Platinum Blue #/25, Red #/10, Pink #/5, Gun Metal 1/1. 98 cards. Shop autographs on eBay. PARALLEL CARDS: Gold #/99, Blue #/75, Platinum Blue #/25, Red #/10, Pink #/5, Gun Metal 1/1. PARALLEL CARDS: Gun Metal 1/1. 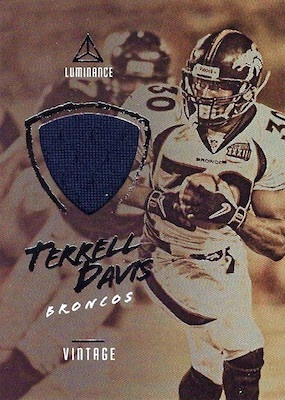 PARALLEL CARDS: Prime Platinum Blue #/25 or less, Premium Gun Metal 1/1. PARALLEL CARDS: Gold Ink (25 copies or less), Blue Ink (5 copies or less). PARALLEL CARDS: Gold #/25 or #/10, Platinum Blue #/10 or #/5, Gun Metal 1/1. PARALLEL CARDS: Prime Gold #/49 or less, Prime Platinum Blue #/25 or less, Premium Gun Metal 1/1. PARALLEL CARDS: Prime Gold #/49, Prime Platinum Blue #/25, Premium Gun Metal 1/1. 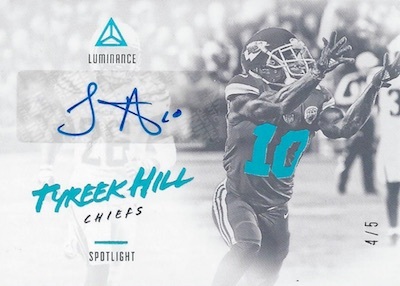 View the 2018 Panini Luminance Football checklist spreadsheet. Looks like Panini might have finally gotten their sh*t together. These mock-ups look great. Ya, super stoked for these. Man they look amazing. Any estimates on MSRP a hobby box? Looks like pre-sale prices are around $110-115 per box. These look cool. Panini has great ideas now and again–Gala, Black Gold. But it’s not consistent. Maybe they are mastering Chrome technology and getting the picture than action shots are better than isolated ones. The Draft Day autos look wicked awesome, the action cards are too. Cards look nice. Are these “hobby” only? Haven’t seen anything about retail. 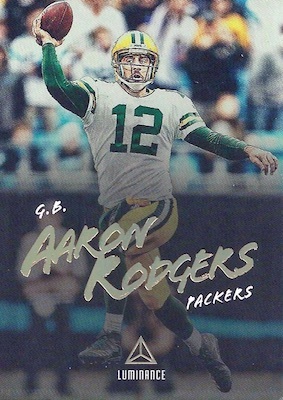 I bought a box of these because they look awesome, and I respect the move to give unknown players their due (though why Justin Tucker isn’t here I don’t know). But Nick Vigil over Nick Foles? Horrible design, dull, boring and serious lack of color & brightness. Looks like a smoke film on each card. Pro Set cards from 1990 look better. Brand new design with rational price. I bought a case for myself. Bought two boxes yesterday. Beautiful cards. Got a 5/5 Joshua Jackson auto. Saw a /5 Archie Manning and Barkley /5 autos being pulled from the same case. Wow – Panini did great! Love the look of these, finally something unique that will also display well! This product is really nice. Panini did a great job combining the darker images with right color ink and the non bordered cards are NICE!! Boom lets get some hits!! I’m here, Bill, and I do the best that I can. I don’t actually see any questions from you above. Thanks Trey — youre the best ! Love the look of these. Wish they would have waited for the rookies to be in their pro uni’s, but oh well. any inkling of there being HOT boxes in this product? I like the look of the draft day cards but must be in the minority as these cards aren’t selling for much on the secondary market. I don’t understand putting the points in place of autos, there are enough minimal value autos that there should be enough to go around. Well, my experience from the 4 hits was a 5th rounder, a 6th rounder, a nobody vet jersey, and the dreaded 150 points card. Panini and their points cards! You dont pay over a $100 for a product, to get “credit” which can only afford you another products throwaway junk leftovers. Better value out of Classics or virtually any other lower end product. 2018 Panini Luminance Football Hobby Box - Factory Sealed! 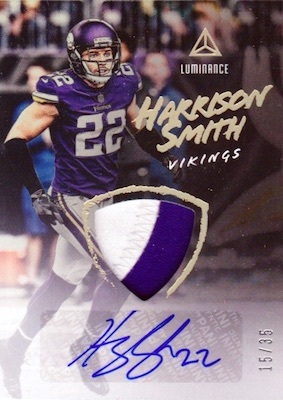 2018 Panini Luminance Football Box - Hobby - 4 Hits!! !